My husband and I recently went to Norway on an Arctic Nights to Remember tour (departing Gatwick 30th Jan 2015). I just wanted to let you know how much we enjoyed the holiday! It felt like we crammed so much into a short visit, but it never felt hurried. The overnight stay and activities at Camp Tamok were fabulous and the Hotel With was perfect for our stay in Tromso. The staff at both the hotel and Camp Tamok were extremely hard working, helpful and friendly. All our flights and transfers once in Tromso were seamless. Thanks so much for a wonderful weekend and a winter experience that we'll remember for ever! Scheduled flight from London Gatwick direct or Heathrow via Oslo to Tromsø. Transfer to and check in at Hotel With, ideally situated close to the quayside in the city centre. You may choose to take an optional evening excursion and go in search of the Northern Lights, take a Northern Lights Arctic cruise or even a late night husky or reindeer safari. 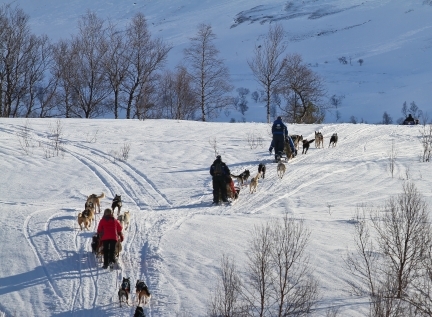 Alternatively a light buffet supper is served at the hotel and you can take in the sights and sounds of Tromsø, which boasts its own fair share of attractions. Breakfast and morning/early afternoon free. Late in the afternoon you will transfer to Camp Tamok for a 30km evening snowmobile safari, climbing up 800 metres above sea level to a frozen lake where you can try out ice fishing. Return to the Camp for supper round an open fire and experience the peace and tranquillity of a night in the wilderness before turning in for your ‘Arctic Night to Remember’ in either the communal cabin, lavvu or private cabin. Breakfast before meeting your excitedly barking Alaskan huskies. 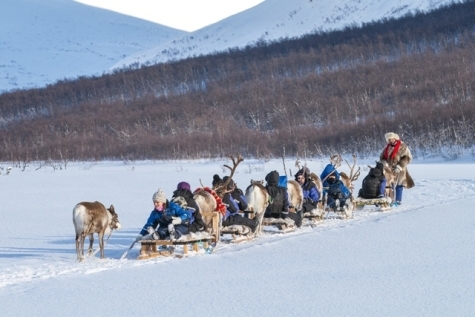 Mush in pairs and share the driving along a 15km trail through the mountainous and forested landscape of the Vass valley where the contrast between tundra, lake and mogul like terrain is as dramatic as it gets. Return to Camp and transfer back to Hotel With where you can once again opt for a further evening safari excursion. Breakfast in your hotel before transfer to airport for return flight(s) to UK. 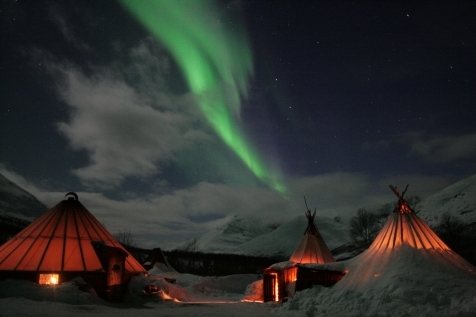 Camp Tamok, in the Northern Lights heartland, is located outside of Tromsø amongst lofty mountains, fjords and the Lapland tundra that dominates the region. As well as being well away from any light pollution, the area is known for its dry climate and many days of clear sky, maximising your chances of sighting the Northern Lights. Camp Tamok is a wilderness experience like no other and is an ideal setting for the snowmobile, husky and ice-fishing activities on offer. This comprises of four bedrooms and two loft rooms accommodating up to 12 guests. The cabin is heated by a wood stove and lit by oil lamps thus offering a warm and a cosy place for a restful night’s sleep. A traditional lavvu where you will sleep in winter sleeping bags on top of several skins. Open wood fires endeavour to keep out the chill but temperatures can drop to zero. The lavvu accommodates up to 12 people and you each have a separate berth. This is the most private and romantic accommodation. Choose one of 3 small aurora cabins. Heated but without water or electricity, these are ideal for couples as you can lie in bed gazing out of the rooftop window through which you can view the aurora when visible. This is the most private and romantic accommodation on offer. Choose one of three small aurora cabins. Heated but without water or electricity, these are ideal for couples, as you can lie in bed gazing out of the rooftop window through which you can view the aurora when visible. 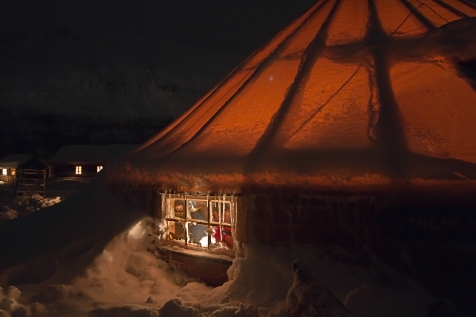 A gamme is a private Sami tent, ideal for romantic couples, who wish to try out a proper Arctic experience and still have some privacy. The tents do not have water or electricity, but there is an oven to keep you warm and cosy, as well as a double bed, table and two chairs. Located about 100m from the main camp, this cabin is ideal for celebrating a big occasion or getting together with family or friends. Accommodating 2-4 people, you will sleep in the loft, and as the cabin does not have running water or electricity, you'll keep warm by feeding the fireplace with wood, as you cuddle up on the couch. This trip offers the best chance you can get to spot the Aurora. Your local guide picks you up from the centre of Tromsø and, depending on the level of cloud cover, heads north to a spot where the Atlantic is on one side of you and the Lyngen Alps on the other, or East as far as the Finnish border. The emphasis is firmly on hunting Aurora and where they are most likely to occur, so the trip can last for anything up to 8 hours. During the evening you move location two or three times to provide different backdrop settings and to avoid any light pollution. All levels of photographers are welcome and your guide is on hand to help you produce some memorable shots. Escape the city’s urban lights and travel out to the Tromsø Villmarkssenter where, in between spells lying on reindeer skins staring skywards for the Northern Lights, you can enjoy the warmth of a Sami lavvo’s open fire over which you can grill sausages and sip hot berry juice. In between Aurora sightings you can also visit the centre’s husky kennels and a traditional supper of bidos stewed reindeer will be served. Enjoy an evening cruise on the fishing boat ‘Havcruise’. Enjoy a homemade fish supper on board whilst keeping an eye on the clear skies above for the aurora to burst out over the Sound. 2 nights hotel accommodation in a twin room on a half board basis at the Hotel With. Overnight programme including local transfers, snowmobile & husky safaris and accommodation of choice at Camp Tamok on a full board basis.